Haunted Illinois is excited to announce the date for our fifth Haunter Horde gathering! Mark your calendars for Saturday, July 27th, 2019! 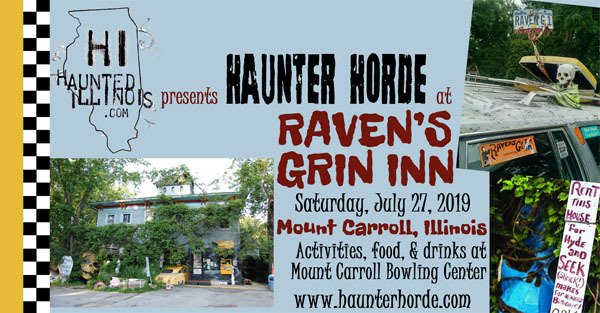 We would like to invite all haunters to join us for the day in Mount Carroll, Illinois; home of the iconic Raven's Grin Inn! We are currently working with Jim and Jessica Warfield (owners of Raven's Grin Inn) to arrange for our group to have scheduled tour times throughout the afternoon and evening! We have also reserved the Mount Carroll Bowling Center (which is just a couple of blocks away) exclusively for the Haunter Horde group! Activities, scheduled tour times, prizes, and sponsors will be announced as they become available. During the event, Haunted Illinois will provide free pizza for all attendees. The venue also has a large menu of other food options, along with drinks (alcoholic and non-alcoholic), available for purchase on-site. Click here to see the menu. 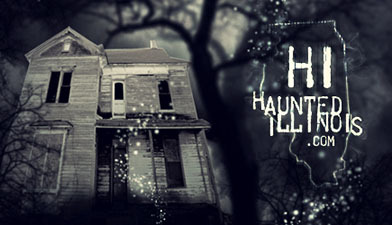 Keep an eye on this webpage, or join our Haunter Horde group on facebook, to get updates as soon as they are announced. Once we announce our schedule and Raven's Grin Inn's schedule for the day, we will encourage you to call the Raven's Grin at 815-244-4746 to reserve a time slot for your tour in advance. For the best show, groups will be kept at/or around ten people at a time. Please note that tours of the Raven's Grin are optional and are not included with Haunter Horde admission. If you are interested in Hide and Seek at Raven's Grin Inn after hours that evening, please send us a message at haunterhorde@gmail.com. If we have enough inquiries (minimum of ten), we will add that to our list of activities. We may need to put a maximum number on the Hide and Seek participants, so contact us quickly to reserve your spot. All proceeds from the auction, donations and admission to the Bowling Center will be donated to the 501(c)(3) charities, Scares That Care and Don't Be A Monster . To further support these fantastic charities, Haunted Illinois will match the first $500 collected. Haunter Horde is a group created by HauntedIllinois.com, in order to promote synergy, fellowship and cooperation throughout the Haunted Attraction Industry. Haunter Horde is comprised of owners/operators, actors, builders, make-up artists and others associated with events big and small, from the large mega-haunts to home haunts & yard displays. For those people traveling a considerable distance to join us on this special day, there are a number of local hotels near Mount Carroll, IL. For your convenience, See our FAQ section at the bottom of this page for lodging options. For those people who aren't on Facebook, all updates will be posted on this page, as well. For more information, check out the FAQ section at the bottom of this page. 04/10/19: Black Oak Axe Throwing has just signed on as a new sponsor! Check out our full list of sponsors below! 04/09/19: Mindtrap Escape Rooms has just signed on as a new sponsor! Check out our full list of sponsors below! 04/03/19: Pretty Sinister has just signed on as a new sponsor! Check out our full list of sponsors below! 03/26/19: Pale Night Productions and Master FX have just signed on as new sponsors, bringing our current sponsor total to 9 haunt-related companies... Check out our full list of sponsors below! 03/04/19: HauntedIllinois.com is excited to announce that the 2019 Haunter Horde Gathering will be held on Saturday, July 27th! Check this page often. More sponsors will be announced soon! - Is this event open to the general public? No. Haunter Horde is open to individuals in the haunted attraction industry, including but not limited to, owners / operators, actors, makeup artists, set designers & builders who work for large-scale commercial attractions, home haunts and everything in-between. - Where will the Haunter Horde Gathering be held? Haunter Horde will be held on Saturday, July 27th, 2019, at the Mount Carroll Bowling Center, 206 N Main St, Mount Carroll, IL 61053. (Click for directions). We have reserved the venue exclusively for Haunter Horde attendees. - Will food and drink be available? Yes. Haunted Illinois will be providing free pizza for attendees. A generous menu of other food choices, along with drinks (alcoholic and non-alcoholic) will be available for purchase on-site. Click here to see their menu. - What time should we get there? - Are there any hotels near the venue? Yes, the following hotels are near Mount Carroll. - How much does it cost to attend? Admission is only $5. All proceeds from the auction, donations and admission will be donated to the 501(c)(3) charities Scares That Care and Don't Be A Monster. To further support these fantastic charities, Haunted Illinois will match the first $500 collected. Please note that the $5 admission only covers free pizza, entry in prize raffles and related Haunter Horde activities. Bowling at the venue, additional food & drinks and Raven's Grin admission are extra. - Is there a limit to the number of people we can bring from our haunt crew? No. There is no limit; the more, the merrier! However, there will be a limit of ten (or about ten) at a time for the tours at Raven’s Grin Inn. - Can I come in costume? No. Although it may have been encouraged at Haunter Horde in the past, due to our change in venue, we ask that you not arrive in costume or horror makeup. - What can I expect at the Haunter Horde Gathering? During the day there will be numerous fun activities. Activities, prizes, and sponsors will be announced. Our event is also a great opportunity for you to meet and interact with other haunters. - Is a tour of the Raven's Grin part of Haunter Horde? No, this is not included with Haunter Horde admission. Touring the world-famous Raven's Grin Inn haunted attraction is an optional activity with an additional cost ($15 per person).